MOBA games are very replayable and players can become very competitive and thus addicted to dominating other human players. It’s not unusual for MOBA gamers to play nothing else. Like MMOs, these games are continuously updated and it wouldn’t be an easy task to just remake them. Yet, that’s exactly what is happening with Dota 2 being remade in Source 2. As of right now, all the major MOBA games including those not featured in this article use DirectX 9, but Dota 2 Reborn might end that. Many of us are excited about Source 2 from Valve. It means a sequel to Half-Life 2: Episode 2 is probably closer to reality than it has ever been. 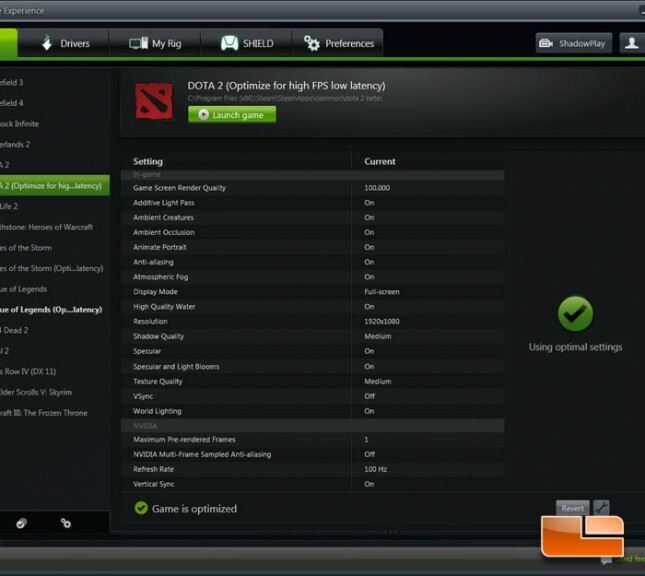 It also means the possibility that Dota 2 might someday use DirectX 12 and Vulkan. However, Dota 2 Reborn Beta is still riddled with bugs that are worth eliminating first. 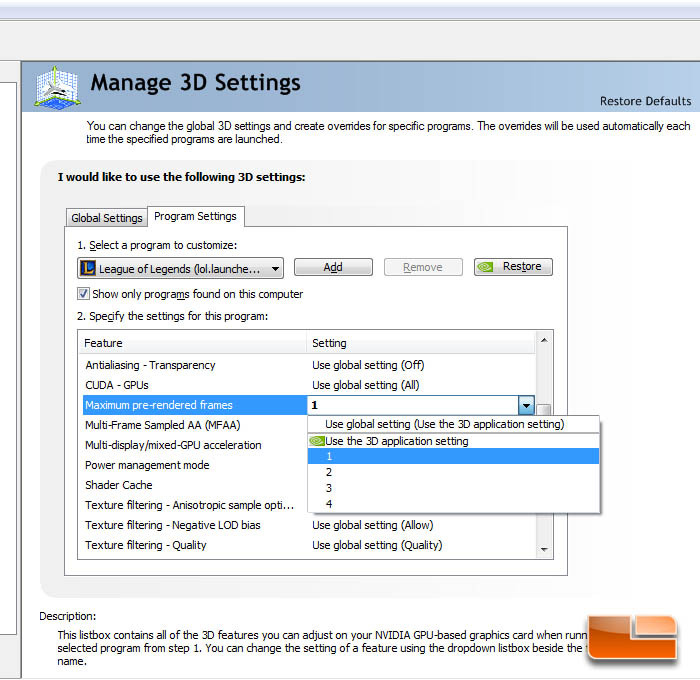 As of now, it doesn’t launch in 64-bit mode by default and the DirectX 11 and OpenGL modes are hidden as well. Regardless of what happens, it is unlikely that League of Legends and Dota 2 will lose their massive control over the MOBA scene. The players have invested so much time acquiring the knowledge, technique, and experience needed to play those games that they aren’t easily going to recommit to a new up-and-coming MOBA. Since those games happen to not require a particularly powerful computer, exclusively MOBA gamers including myself won’t find a compelling reason to upgrade their hardware for 2…4…maybe even 6 years down the line. Even the best of integrated graphics are creeping closer to playing League of Legends on its maximum graphic settings with acceptable results. As such, we appreciate NVIDIA working on finding new ways to improve the graphic experience in MOBA games besides just raw performance and efficiency. 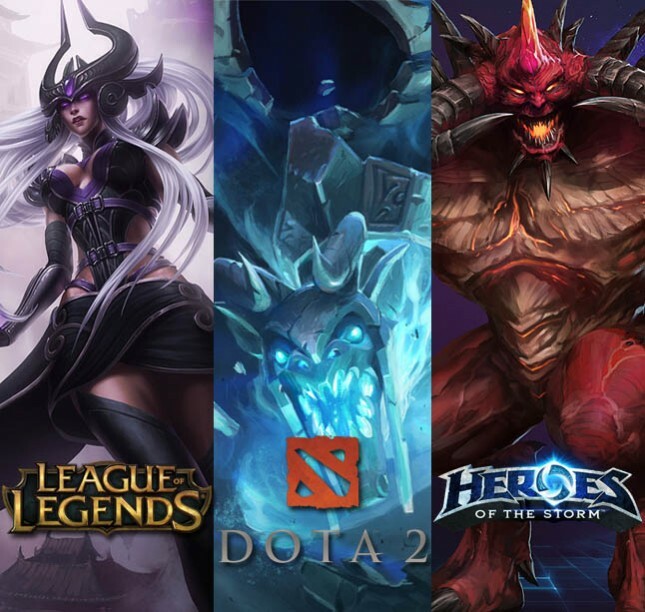 League of Legends and Heroes of the Storm run on game engines launched roughly five years ago, Dota 2 runs on an engine that debuted in 2004 with Half-Life 2. Yet, the explosive growth of the competitive MOBA scene has driven millions of gamers to gear themselves for that competitive edge. Ideas were pitched toward and within NVIDIA to address the demands of this rising market. Yes these MOBA games running on old game engines aren’t graphically demanding, but they have their moments. Even we saw framerates nosediving during intense game action. It was the expectation that an affordable, but still powerful card would be able to handle the worst on-screen scenarios. From that, NVIDIA targeted the GeForce GTX 950 2GB video card at MOBA gamers and the fairly undemanding games they enjoy playing. The results we saw in our MOBA benchmark tests was not what we expected. 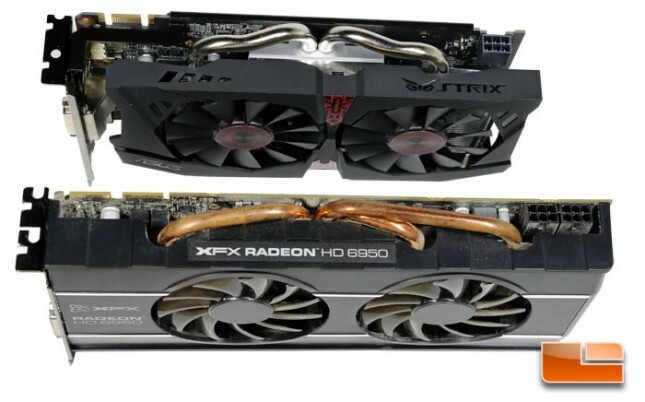 The NVIDIA GeForce GTX 950 is fairly powerful which you can learn more about in our proper GTX 950 review, but it’s overkill for Dota 2, League of Legends, and Heroes of the Storm at 1920×1080. Those moments when the framerates took the nosedive were being caused by the limitations of the CPU and not the video card. We realized this when the 5-year old AMD Radeon HD 6950 1GB was performing as well or very nearly as well as a new GeForce GTX 950 2GB and when overclocking the CPU resulted in even performance gains on MOBA games with either video card. The GeForce GTX 950 should have run circles around the Radeon HD 6950 and it only did that in the synthetic 3DMark benchmark and during power efficiency testing. What this means to those who enjoy MOBA games while caring about graphics performance is that we might not need a video card with a GPU as powerful as the GTX 950. Yes, you might want a better processor if the minimum framerate concerns you, but the occasional dip into 50 FPS territory is still very playable. In any case, I am unable to determine how powerful of a processor is needed to get perfect 60+ FPS playback given the limited hardware I have on hand. Getting back to graphics, NVIDIA previously presented the GeForce GTX 960 as not only “The Sweet Spot GPU” at $199, but also the “#1 GeForce GPU For MOBA Gamers.” They can still lower the bar after the GeForce GTX 950 and it’ll still be overkill for MOBA gamers. Despite all that, I’m not advocating sticking with older graphics hardware for playing Dota 2, League of Legends, or Heroes of the Storm even if the raw performance is acceptable. GTX 950 and Maxwell gave a huge benefit I hadn’t been able to experience for years and it’s something that can’t be demonstrated with a chart or table. It does look like GTX 950 was optimized for MOBA games. I can see the lack of screen tearing or microstutter with my own eyes. I was actually taken aback when I saw League of Legends for the first time running as one fluid moving picture on my monitor connected to the GTX 950. It was like seeing GSync again without actually having GSync. Those optimizations on the GTX 950 seem limited to those games for now because playing a game that isn’t Dota 2, League of Legends, or Heroes of the Storm will produce stutter and tearing that looks the same from even a 5-year old Radeon HD 6950. The frame time data doesn’t mean a whole lot when that’s happening. The other neat trick Maxwell offers is faster response time. Faster renderers and a reduction of number of buffer frames waiting to display on-screen results in a not so insignificant reduction of latency. This is cool to see in new technology that gives gamers that advantage. NVIDIA makes it easy for almost anyone to speed up the time it takes for actions to appear on-screen. We’re talking at the press of a button easy. 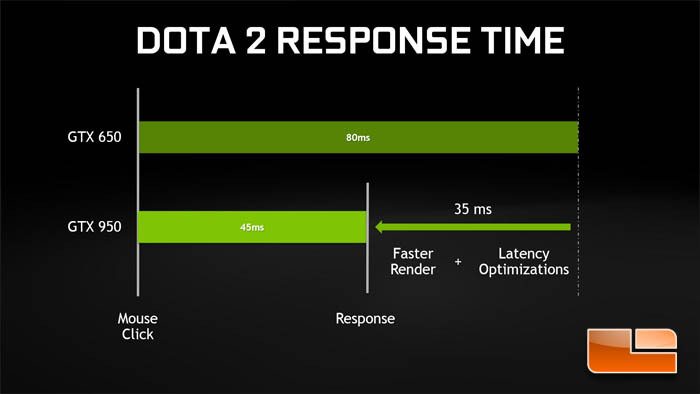 GeForce Experience has presets for Dota 2, League of Legends, and Heroes of the Storm that allow users to switch on optimized game and driver settings including new high framerate, low latency presets. That’s almost for everyone. Those low latency presets are primarily intended for those with high refresh rate monitors. For those of us with 60Hz monitors, which is a realistic expectation of those buying a midrange video card, a few more steps will have to be taken to get personalized low latency optimizations. Maxwell introduced the ability to control the number of pre-rendered frames that could be cached. Knowing where this setting is within the NVIDIA Control Panel allows one to set up personalized low-latency optimizations. 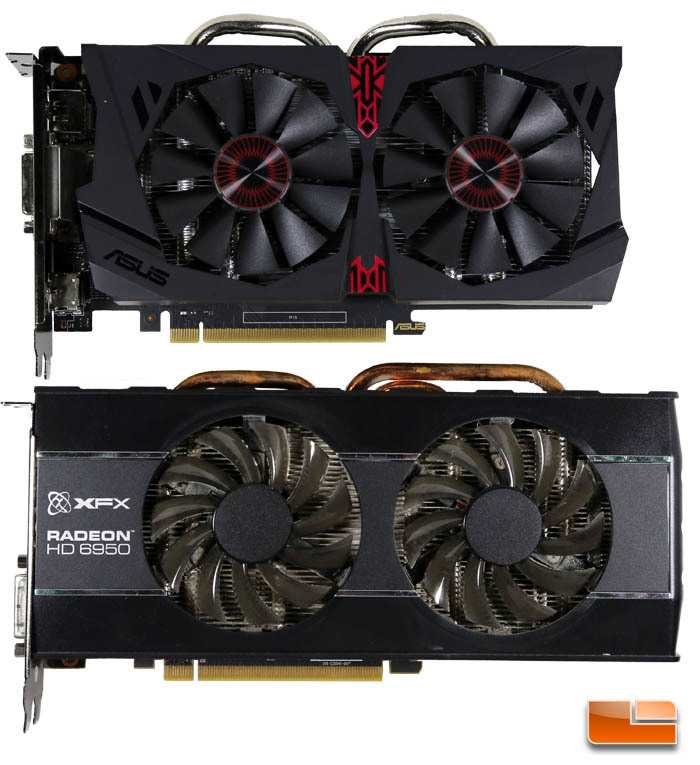 Looking back to our data, we were surprised to see the results we got – two video cards that almost couldn’t be more vastly different outputting the same framerate performance for the narrow set of games tested. However, we can say for sure say that MOBA optimizations from GeForce GTX 950 make a drastic difference. They are just better experienced in-person. It’s obviously too early to tell if NVIDIA will continue to lower the bar when it comes to releasing another weaker GPU for MOBA gamers, but if anything, doing so would bring the benefit of Maxwell to a greater number of players. Legit Bottom Line: When pushed to the limit, it’s the CPU that’s the limiting factor for MOBA game performance regardless if the video card is a GeForce GTX 950 or Radeon HD 6950. Yet, Maxwell brings a number of attractive features and the GTX 950’s MOBA specific optimizations look better in-person than charts can show.